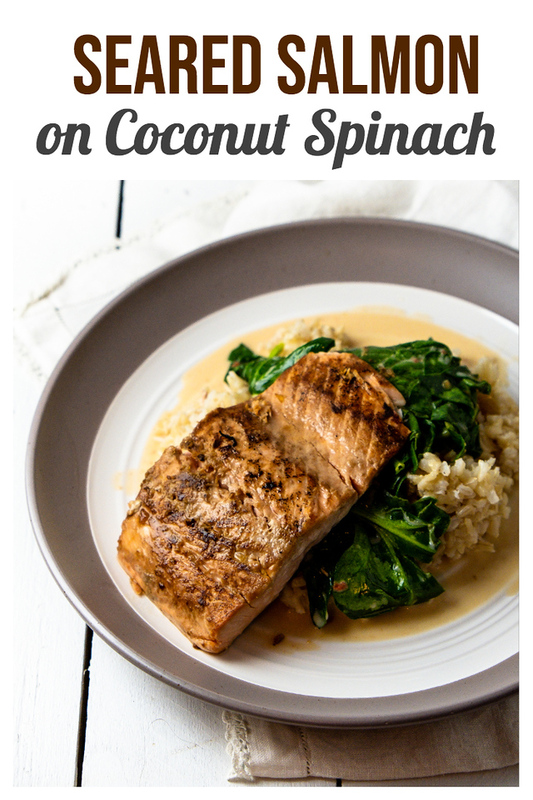 Seared Salmon on Coconut Spinach – a simple, healthy and delicious salmon dinner! Salmon, ginger, sesame oil, soy sauce, garlic, red chili peppers, chili-garlic paste, coconut milk, lemon juice and spinach. Everyone loves this easy salmon dinner! 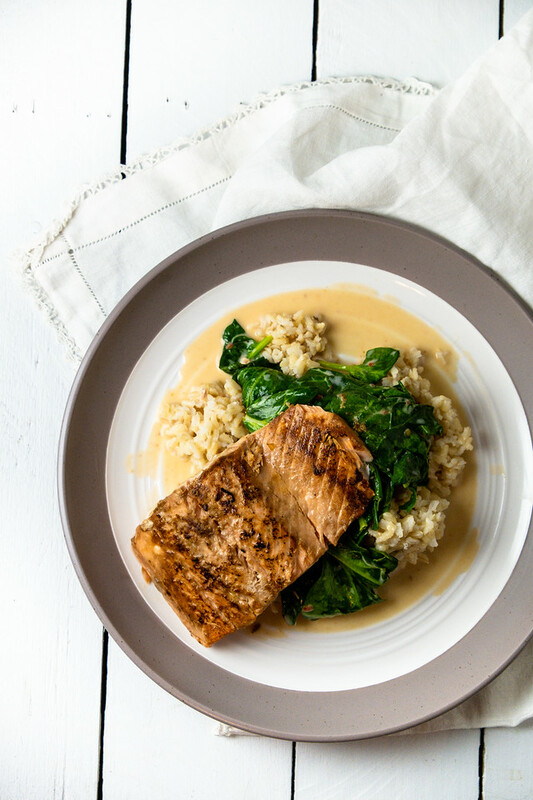 Click here to pin this Seared Salmon on Coconut Spinach now! Have you heard how healthy the Mediterranean Diet is? I know people swear by low carb, Whole 30, Keto and whatever other diets there are out there. However, what I love about the Mediterranean diet is that it’s more about including foods than not including foods. It encourages you to eat lots of fruits and vegetables, whole grains, beans and legumes and fish and seafood. Poultry and dairy in moderation and red meat and sweets rarely. That’s a diet I can live with. Salmon is one of the fish that is highly recommended on the Mediterranean diet. Luckily we love salmon! Now, I know today’s recipe is an Asian recipe, however it embraces all the good things. Heart healthy salmon, iron and vitamin rich spinach, and coconut milk all served over brown rice. Note – if you are going to serve this over rice, you need to start the rice first, it will take longer to cook than everything else! Once you start cooking, the dinner comes together quickly, so assemble all of the ingredients first and do your chopping and prepping. The salmon begins with an amazing marinade. The marinade is grated ginger (tip – I keep my ginger in the freezer and grate it right from the freezer with a microplane,) toasted sesame oil, and soy sauce. The salmon marinates in this flavorful marinade for 10 minutes at room temperature. Then you do a quick sear (about 3-4 minutes per side) in your favorite skillet, I use a cast iron skillet. While the salmon is marinating, you can make the coconut spinach. For the coconut spinach, I used the spinach that you buy in bunches, not the bagged baby spinach. The baby spinach would work, it will just wilt down even more than the larger, more robust spinach. When using the bunches of spinach, you really need to clean it good. I fill a sink with water and add the spinach and swish it around really well, letting the dirt fall off and settle to the bottom. Then I pull it out and spin it dry. To make the coconut spinach, you cook the garlic, chilies and chili paste in a saucepan for a couple of minutes. Then you had the coconut milk and lemon juice. Add the spinach and toss until it wilts. This recipe is so good! The salmon gets a kick from the ginger and a mellow earthiness from the sesame oil and soy sauce. The coconut spinach is a little spicy from the chili paste and the chili peppers, but it’s perfectly tamed with the coconut milk. You really do want to serve this over something to soak up that amazing sauce. This easy, healthy salmon dinner is on the table in under 30 minutes. If you are going to serve it over brown rice, however the rice will take a little longer. In a shallow dish combine the ginger, sesame oil and soy sauce. Add the salmon flesh side down. Marinate for 10 minutes. While the salmon is marinating, place the garlic, chili peppers and chili paste in a saucepan over medium heat. Cook for about 2 minutes to allow the flavors to blend. Stir in the coconut milk and the lemon juice and simmer for about 4 minutes. Add the spinach using tongs a little at a time, stirring as it wilts. Reduce heat to low to keep it warm. Heat a non stick skillet over high heat. Remove the salmon from the marinade and place flesh side down in the pan. Sear for 3 minutes and then turn over. Cook for another 3-4 minutes or until desired degree of doneness. Update Notes: This was originally published in 2007 and has been updated for 2019. This salmon was so flavorful and delicious! But the coconut spinach really put it over the top! My favorite part was the coconut spinach, great add thank you! What a delicious looking recipe! I love seared salmon and sautéed spinach. I’ve never actually thought of adding other ingredients in spinach except for maybe garlic, so I’m definitely intrigued and need to try your recipe soon. What a deliciously simple but PERFECT healthy recipe! This is jam packed with all the flavors I crave and your photos are gorgeous! Thanks for sharing!! I’m definitely going to try this…The paring of flavors you have going here at fabulous! The coconut spinach sounds really interesting! Bookmarked to try! Pairing it with salmon sounds perfect as well. Peter, thanks! It really is so good! Pam, your salmon looks great, from the pan-fry and soy. The flavours sound good, I’d eat at your place anytime!